There might be a variety of different iPhones to pick from now, but Apple's phone line-up still pales in comparison to its range of tablets as far as a confusing mix of models goes - Pros, minis, normal iPads... it's not easy to keep track of where Apple's slates are up to. What we do know is that Apple will be back in 2017 with some shiny new iPads to wow the world with, so we've collected together all of the leaks and gossip we've heard so far about what's incoming - hopefully we can simplify the current range of models at the same time. At the moment you can buy no fewer than five iPads from Apple. Starting with the smallest, there's the 7.9-inch iPad mini 2 (launched November 2013) and the 7.9-inch iPad mini 4 (launched September 2015). The fact that the ageing iPad mini 2 is still on sale, and that the newer iPad mini 4 only offers extra speed and Touch ID as upgrades, sums up part of Apple's tablet problem - people don't really need to replace their tablets all that often. You can still buy the 9.7-inch iPad Air 2 (launched October 2014) as well, though this model has really been superseded by the faster, better-looking Pro models. It's still a good budget option but we don't expect an upgrade in 2017. Then there are the Pros, the tablets Apple seems most interested in for the future: you can pick up these speedy, beautiful-looking slates in either a 9.7-inch size (launched March 2016) or a whopping 12.9-inch size (launched September 2015). With Apple now selling a 5.5-inch phone, is there room in the market for a 7.9-inch tablet? Considering Apple still sells the three-year-old iPad mini 2 we wouldn't necessarily be holding our collective breath for an iPad mini 5 during 2017. That said, even the iPad mini 4 is over a year old, so in that sense a refresh is due. Also worth noting is that the 7.9-inch size iPad is the only one not to get a Pro upgrade - that is, more power under the hood, extra speakers, clip-on connectors for a keyboard, and an enhanced display. 2017 could well be the year that Apple gives all its iPads the Pro moniker... at which point it might just start calling them iPads again. If there is an iPad Pro mini on the way then all the signs are pointing to March for a launch date, and if Apple settles into this routine every year or two then it gives its product range a nice boost at the halfway point of the iPhone cycle. The 9.7-inch iPad Pro is Apple's newest iPad, and if past form is anything to go by, Tim Cook and his fellow executives won't be in any hurry to push out an upgrade in 2017. The 12.9-inch model is more interesting, because it's older and therefore next in line for a new version. The question is whether Apple has seen enough demand for such a huge tablet to make it think that a follow-up model is worthwhile - it's certainly one way of distinguishing the top end tablet in its range from all the rest. There's also a rumour that a brand new 10.5-inch iPad Pro is on the way. That sounds a little too close to the 9.7-inch size for us to put too much stock in the claim, but it's possible that Apple will abandon anything below 10 inches and leave more of a gap between its phones and tablets next year. Another possibility: we've heard a lot of talk that Apple wants to build its next generation phones and tablets with an all-glass front, with minimal bezels and the home button embedded in the screen, which would allow a new iPad with a 10.5-inch display to be the same physical size as the current 9.7-inch editions. As usual, you can also expect slightly thinner dimensions, slightly less weight, and a few more minor refinements. 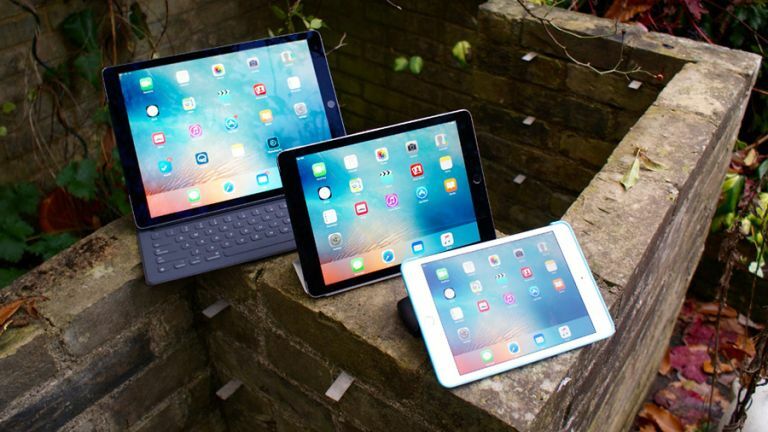 Apple is also likely to be keen to keep a few relatively cheap iPads on the books, which means the iPad mini 4 would stay on sale and the iPad Air 2 could even get a minor bump and perhaps ditch the "Air" label at the same time. We've already mentioned one problem for Apple's new tablet department - sluggish user demand for regular upgrades - but there's another issue too: there aren't that many ways to improve on the iPad. All three sizes are in line for a speed and memory bump in 2017, and they may well skip the A10 chip we've seen in the 2016 iPhones to go to the next-generation A10X edition being worked on deep in Apple headquarters. That's going to mean a significant jump in both processing power and power usage, so expect longer battery life too. 3D Touch is also overdue on Apple's oversized devices - considering the Cupertino company makes such a song and dance about it being included on its phones, you wouldn't think it would leave the feature off its tablets for that much longer. Finally, all of the models Apple launches in 2017 should get the True Tone display feature currently available on the 9.7-inch iPad Pro - it allows you to adjust the colour temperature of the display, based on the ambient lighting conditions. There should be some iPad-specific treats in iOS 11 as well, which is likely to be announced at WWDC 2017 in June - think improvements to the Split View introduced in iOS 9, giving users more reasons to invest in a device with a bigger display. Apple knows it has to freshen up its iPad line after a so-so 2016 for its tablets, so there's good cause to get excited about what's in store for 2017. With that in mind we'd recommend holding off on a new iPad purchase for now - until March 2017, anyway.